There are so many options when it comes to conservatories and this is why the team at iGlaze are happy to offer you a free, no obligation quote along with guidance and advice on the best conservatory for you, your family and your home. When it comes to conservatories, we are a ‘one stop shop’. We can supply and fit your complete conservatory for you, saving you going to different suppliers for different products and services. All of the conservatories we build are completely bespoke to each customer, they are built from the ground up and designed to suit the individual customers’ needs. We complete every aspect of the build and can also offer such as heated floors, tiled floors and air conditioning. All of the roofs we fit are thermally efficient, reflecting the sun and heat in the summer when you want a cooler space and retaining the heat in the winter when a warmer space is required – therefore helping to lower your energy costs and making your new space liveable all year round. All the glass we supply is self cleaning on the outside too making maintenance easier. The five traditional styles of a conservatory are Edwardian, Victorian, P Shape, Gable end and Lean To. Victorian Conservatories are characterised by the segmented and multi-faceted design that gives off a majestic curve to a home. 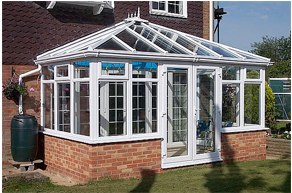 This style of conservatory is very popular with people looking to add a touch of ‘grandeur’ to their home. A Victorian conservatory is known to be quintessentially British in its design and can offer some really glorious views of a garden through multiple bay windows. A P-Shaped conservatory is ideal for larger properties and combines a lean to conservatory with a Victorian conservatory to increase the living space within your home. Because the conservatory extends in different directions the P-Shape conservatory creates a very versatile style and is the longer area of the conservatory is often used as a lounge or dining room style area for larger families, or sometimes this space is used as a playroom for younger children. Gable end style conservatories let in a vast amount of light and give a greater feeling of more space; due to the shaped roof. Gable end style conservatories are a great way of keeping the style consistent with the existing property roof pitch. These are a very popular choice for many home owners. 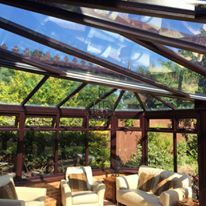 A lean-to conservatory, also known as a sun lounge conservatory, is one of the most traditional styles of conservatory. It is excellent for those looking to increase their living space on a tight budget. The lean-to conservatory offers a well suited shape that allows the maximum light from the sun and is very popular for cottages and bungalows, offering the best value for money when it comes to conservatories. Why not contact us for advice or help with your conservatory requirements, we are happy to help and always offer a free, no obligation quote. A conservatory is an investment in your home, however if you’re finding that it feels a little outdated or in need of repair, our conservatory roof replacement service can offer this much loved a space a little enhancement that can make it feel brand new once again.